You are here: Home / News / News / Check Out Our New Look! Celebrate Our New Name and Look! We are excited to announce the rebranding of our business from Jim Shreckhise Landscape and Design to Shreckhise Landscape and Design. Since our son, Trent joined the family business, we knew it was time to update our name and our look to reflect the changes in our business. 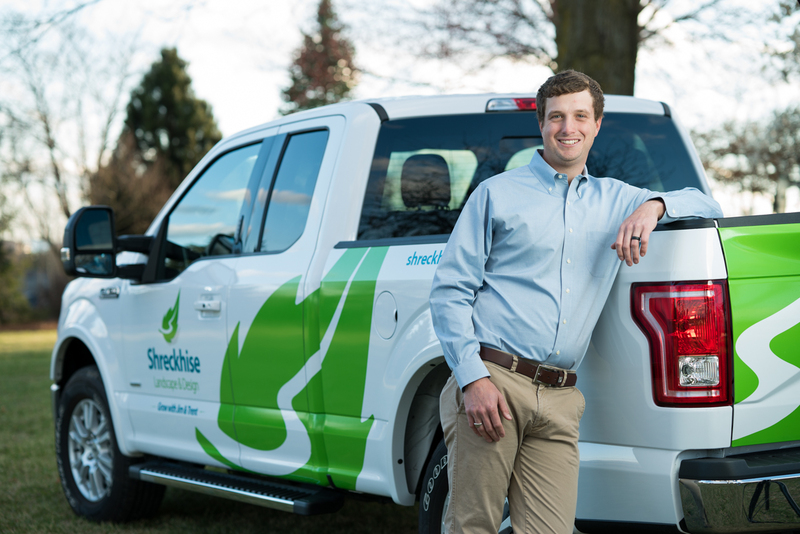 Trent dual-majored in Ornamental Horticulture and Agriculture Economics at Virginia Tech and brings his education and experience back to the Shenandoah Valley after working for landscaping companies in both Richmond and Northern Virginia. Trent brings a young and fresh perspective to our business and we couldn’t be more excited to celebrate three generations of our local, family business. New Logo Reflects Our Landscaping Style. Our new logo reflects the aesthetic fundamentals of our landscaping design – classic, unique, and practical. The “S” in the Shreckhise leaf symbolizes natural growth and our journey into the future. We feel it’s a perfect reflection of our business during this transition and is more inclusive of our current team. Our On-site Nursery Gives You Options. At Shreckhise Landscape and Design we are proud of our 7 acre nursery where we grow high quality and often unusual plants. Jim and Trent’s knowledge of the climate and soil of the Shenandoah Valley gives them the data to choose plants that successfully thrive in our area. When you choose Shreckhise Landscape and Design, you choose professional landscapers with the educational background and experience to make your yard beautiful. New Name – Same Innovative And Dependable Service. While we are excited about our new look and name, please remember that you can count on the same great service Jim’s dad started providing in 1945. Our team is excited to design, schedule, and implement your next landscaping project today. Contact us to discuss your ideas and begin the process of beautifying the exterior of your home or business. Landscape Gravel vs. Natural Mulch The Time for Your Spring Landscaping Evaluation Is Here!